Rabbits are symbols of luck and fertility. 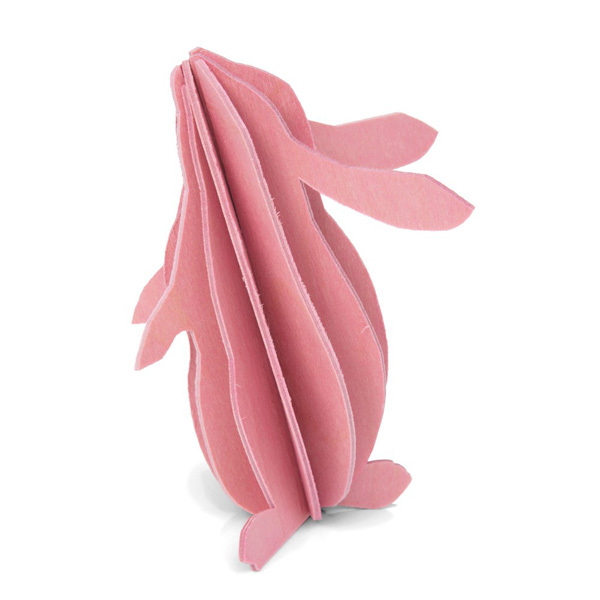 Three dimensional 9cm Rabbit in Pink, comes flat packed ready to construct. Lovi is a family run company based in Finland. They design small 3D wooden figurines which are flat packed and can be hand assembled easily, no tools required. Slotting cleverly together the beautiful Lovi shapes provide a sense of wonder as they take shape and come alive. Lovi products use only 100% Finnish wood, from certified Finnish forests, which are re-planted after felling. Today northern forests are growing at a faster rate than they are felled.